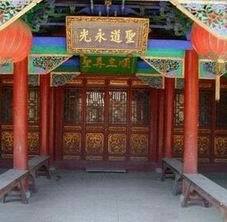 Bukui Mosque (bǔ kuí qīng zhēn sì 卜奎清真寺) is also called Worship Mosque, which is a Islamic ancient building with Chinese national characteristics in Qiqihar, Heilongjiang in northeast China. 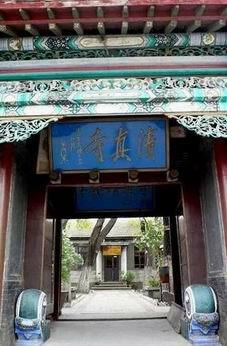 It is located in Mosque Road off of Bukui Street (bǔ kuí jiē 卜奎街). 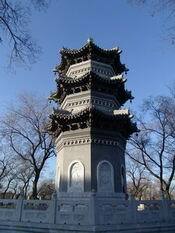 It was built during the Qing Dynasty, and listed in 2006 as a national-level protected cultural relic. It is the largest and oldest mosque in the province. The East Mosque, a three-storey, 374 square meters (4,030 sq ft) building constructed in the 23 rd year of Kangxi 's (kāng xī 康熙) Reign in Qing Dynasty (qīng 清) (1684), predating the city of Qiqihar by seven years. There were five thatched cottages at the beginning, which were frequently rebuilt and expanded afterwards. The West Mosque, a two-storey, 173 square meters (1,860 sq ft) building constructed in the 2 nd year of Xianfeng 's (xián fēng 咸丰) Reign (1852) by followers of the menhuan (Menhuan (mén huàn 门宦) is a term used by Chinese-speaking Muslims) who emigrated from Gansu. There were 60 thatched cottages at the beginning, which were renovated afterwards. The mosque contains roughly 2,000 square meters (22,000 sq ft) of constructed space; the whole compound covers an area of roughly 6,400 square meters (69,000 sq ft). The two prayer spaces together can hold a total of roughly 450 people. The distribution of the East and West Mosque is similar with each other; both are palace brick and wood construction. The mosque's long history has led to a saying in Qiqihar: "the mosque existed long before the town Bukui." In 1958, the two mosques were reorganized as a single mosque, with the name "Qiqihar Mosque". The mosque was listed as a city-level protected cultural relic in 1980, and as a provincial-level protected cultural relic in 1981; its name was then also changed to the present "Bukui Mosque". An assessment done that year found that while the East Mosque was in relatively good condition, there was serious structural damage to the West Mosque. Reconstruction efforts were undertaken in 1989-1990. On 25 June 2006, the State Council of the People's Republic of China entered Bukui Mosque onto the 6th list of national-level protected cultural relics, under the protection of the State Administration of Cultural Heritage. 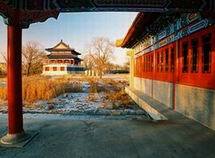 The main building is composed of Big Hall (Worship Hall), Kiln Hall and Arch. The auxiliary buildings are Entrance, Halls, Dean Room, Lecture Hall, Shower Room and Funeral Room, etc. The area of the East Mosque Big Hall is 374 square meters; the area of the West Mosque Big Hall is 173 square meters, which could hold 450 people for worship. The Big Hall faces west. 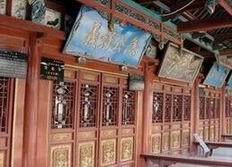 before the main hall-style veranda wide Juanpeng Gallery (juàn péng shì wǔ láng 卷棚式庑廊), there are cornices tilt, color rafters phase Street, daisy-like brackets, the number of re-Talon, and set off by the six big red bars. A horizontal plaque of Tasmi (tài sī mǐ 太斯米) in Arabian is hanged on the main gate with a stele of Zealous for Common Weal hanged on its left. 20 hinge doors are engraved with musical instruments, chess, painting and calligraphy, flowers in four seasons and exquisite decorative patterns. The Kiln Hall consists of pagoda base, pagoda body and pagoda top. 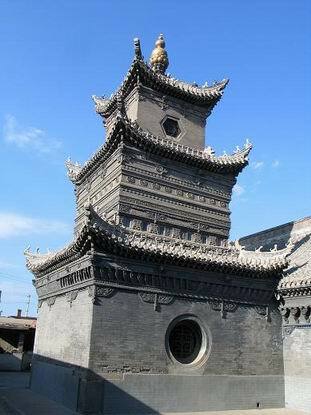 East Mosque Kiln Hall is a 3-storeyed square pagoda style, the middle storey is entirely built with bricks with patterns of pillars, teeth and running fret shape. There are 9 round brick carvings on each face, with Holy Lord Names and Holy Lord Images. A gilded copper gourd with 1.9-m height and 0.9-m diameter is inlaid on the Lotus Jeweled Seat of the pagoda top, and there are 40-cm-long crescent ornaments, which are symbols of "Variable Moon and Stars" for Islam. 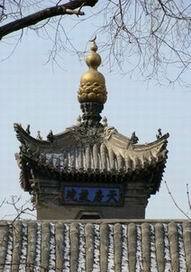 The Islamic building combine's lotus, gourd and crescent are very rare in China. The West Mosque Kiln Hall is a 2-storeyed building. A hexagonal tin ornament that is 1-m-high and 0.5-m-diameter, semi-round in middle and bowl-shape in bottom is inlaid on the brick carving Lotus Seat on pagoda top. The rare manuscript of Alco ran, Explanatory Notes of the Four Books the 8th year of Xiangfeng's Reign (1858) Edition and other ancient books re collected in the Mosque. The East Mosque and West Mosque were combined in 1958. The Mosque was ranked as the Municipal-Level Cultural Relics Protection Unit and was rebuilt in 1980. 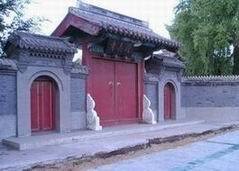 It's ranked to be the Provincial-Level Cultural Relics Protection Unit and was named as Bukui Mosque in 1981.